Throughout the week our members will be greeted with bonuses that everyone can enjoy. 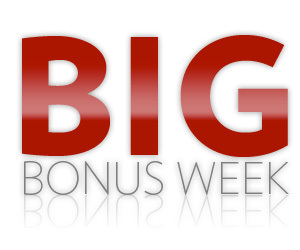 From Saturdays 166% up to $/£/€166.00 to Tuesday’s 100% up to a massive $/£/€200.00 bonus! Make sure that you login to take advantage of these great offers! Awesome 100 Sunday! On Sunday from 00:00GMT until 23:59 GMT, all members on their first deposit of just $/£/€40 or more will receive $/£/€60.00 bonus. Play with 100.00! Value Bonus! From 00:00GMT until 23:59 GMT, all members on their deposit of $/£/€10 or more will receive a 120% bonus up to 120.00 bonus. BIG BONUS TUESDAY! From 00:00GMT until 23:59 GMT, all members are invited to receive a 100% bonus up to $/£/€ 200 on your first deposit of $/£/€ 30 or more.